…without actually reading any Dan Brown. Transworld Publishers have done a nifty piece of blogger outreach by inviting anyone interested in reviewing some of their books to either get involved on their blog or, if they don’t have one (or don’t want to use it for the reviews), writing Amazon reviews. There’s no pressure to write a positive review, they just want word of mouth out there about their books, and you can choose which four you want from a list of 15 and they’ll be sent to you. It’s all explained rather better on Transworld’s Between the Lines blog, where you can also leave them a comment to get involved if you’d like to. The four books I’ve chosen are listed below, so I’m looking forward to receiving the first (once it’s read and reviewed, I get the next one). Since reading is the most relaxing thing to do apart from sleep between Ramona’s feeds and I mentally review every book I read anyway, this is perfect for me. You’ll love Prep! I read it pre challenge and it’s like a dark Mallory Towers, with lust and misery. Bit so so on Amberville though. 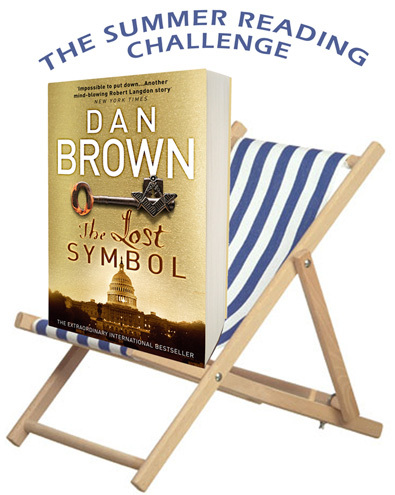 I’m also taking part in the Transworld Dan Brown Summer Reading Challenge without actually reading any of Dan Brown’s books! I’ve just finished reading my 3rd book for the challege (Second Hand Heart by Catherine Ryan Hyde). My 2nd book was Bryant & May On The Loose and I’m sure you’ll enjoy it… I’m already looking at reading the next book in that series as it follows on from “On The Loose”. My 1st book was If I Stay by Gayle Forman. My final & 4th book (which I’ll hopefully get next week) will be 61 Hours by Lee Child. Hi Nikki-ann – sorry for taking so long to reply! I too am now keen to read the next one (and go back and read some of the others from the series). Just need to get on with the review now so I can read the next book on the list!